Just Ask a Woman is a powerful book about how to tap into female consumers' needs. Mary Quinlan, the founder of the premiere consultancy dedicated to marketing to women, has personally interviewed 3,000 women in the course of her research for Just Ask a Woman. Women are the decision-makers in an estimated eighty-five percent of household buying decisions, and yet far too often, products marketed specifically to them fail to connect with their needs. Here, Quinlan explores topics such as how women judge brands and advertising, how they make decisions, the effects of stress on their consumer behavior, and their increasing demands for service and communication. Quinlan rejects the traditional focus group approach in favor of highly energized and intimate talk sessions where women reveal their deeper feelings about products and services. In Just Ask a Woman marketers, brand managers, and advertisers will find a revelatory resource filled with ideas and action steps for building your brand with women-from a woman who has walked in a marketer's shoes. Mary Lou Quinlan (New York, NY) is the founder and CEO of Just Ask a Woman, a marketing consultancy dedicated to building business with women. 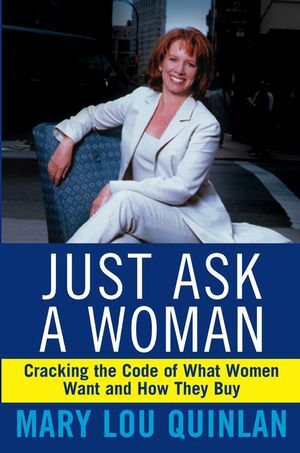 Just Ask a Woman is a division of bcom3, a $15 billion global communications firm whose clients include Citigroup/Women & Co., Lifetime, Saks, Hearst Magazines, Toys "R" Us, and Time Inc. Known as a brand-turnaround expert, she has helped to remake brands like Avon and Continental Airlines. Quinlan has been quoted in The New York Times, The Wall Street Journal, Fortune, Fast Company and Advertising Age and appeared on ABC, CNN, CNBC, Lifetime LIVE, Fox and nationally syndicated news shows. Her articles have been published in Marie Claire, Good Housekeeping, Redbook, and More, among others. MARY LOU QUINLAN is the founder and CEO of Just Ask a Woman, a New Yorkbased marketing consultancy dedicated to building business with women for clients including CitiGroup, Johnson & Johnson, General Motors, and Saks Fifth Avenue. Her twenty-five-year marketing career led to her reputation as a brand turnaround expert, from director of sales motivation and advertising for Avon, to CEO of N. W. Ayer Advertising. She speaks frequently on womens issues, has written for Redbook, MORE, and Marie Claire, and has been featured in the New York Times, The Wall Street Journal, and BusinessWeek, as well as on CNBC and the Lifetime Network. Chapter One: A Checkup for Marketers: Listening or Not? Chapter Three: Deliberate Decision Making. Chapter Fou: The Vigilante Shopper. Chapter Five: The Tug-of-War with the Mirror. Chapter Six: Intimate with Technology. Chapter Nine: A Listening Action Plan for Marketers.